This project was born in 2006 when a Singaporean movie director and an ex musician from the south of China decided to open a live bar in Shanghai. The budget was very low but the client was incredibly good and open-minded to us. The schedule was very tight and fortunately they liked immediately one of the first concepts I proposed to them: a caved space formed from of a digital Boolean subtraction of hundreds of slices from an amorphic blob. The idea looks complex but actually is very simple and was born naturally from the digital 3D modelling environments where me and others enjoy playing with virtual volumes and spaces. 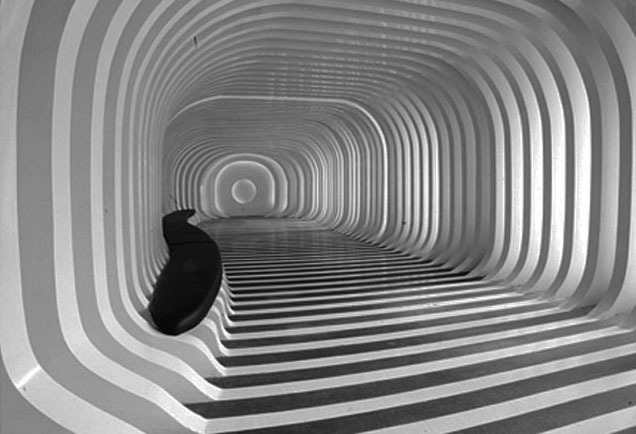 The space was subdivided into slices to bring it back from the digital into the real world; to give a real shape to each of the infinite sections of the fluid rhino nurbs surfaces. In Europe the natural consequence of this kind of design will be giving the digital model to the factory and thanks to the numeric control machines cut easily the huge amount of sections all different from each other. But we were in China where the work of machines is replaced by the work of low paid humans. Using a projector they placed all the sections we drew on the plasterboards and then cut each of them by hands. The cost was surprisingly low and the sense of guilt towards the workers higher. The construction was incredibly fast and was almost finished in a couple of months, when we discovered the naïve clients didn’t have any business plan and the site remained closed for 3 years and was finally completed and opened in 2010 when they discovered how to run the business. This is the story of the ZEBAR, a digital design built into an analogic world.